This executive office chair from Offices To Go™ features attractive, soft black Luxhide leather upholstery over thickly padded seat and backrest cushions with matching mock leather outer trim. Luxhide leather is a bonded reconstituted leather consisting of genuine leather fibers combined with other materials for long lasting durability. Other features include single position tilt lock with tilt tension adjustment, one touch pneumatic seat height adjustment, 360-degree swivel, fixed height padded loop arms, integral headrest portion, and a scuff-resistant molded base with twin wheel carpet casters. 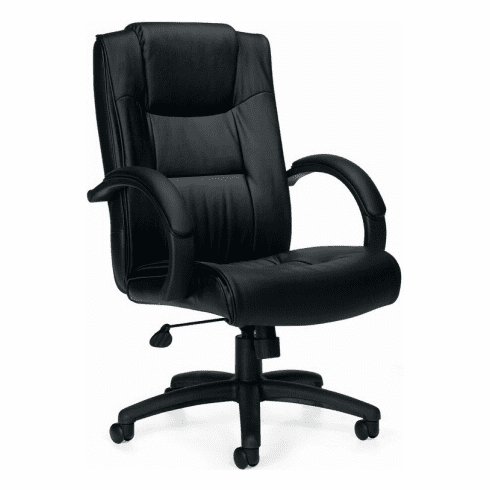 This office executive chair meets or exceeds ANSI/BIFMA standards. Dimensions: Back Size: 21.5"W x 25.5"H. Seat Size: 21"W x 18.5"D. Seat Height: 17" - 21"H. Overall: 44.5"H x 25.5"W x 30"D. Five year warranty from Offices to Go. This chair normally ships within 1-2 business days.